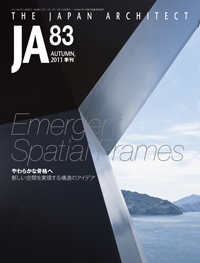 JA83 is a special issue devoted to structural design. Besides the rich variety of ideas conceived by architects, innovative systems produced by structural designers are beginning to give new character to space. Emerging spatial frameworks worthy of attention have been applied at various scales and functions, ranging from houses that resemble furniture to buildings with vast public components.The title of this issue “Emergent Spatial Frames” addresses the cross-fertilization of contemporary spatial ideas and structural principles. Focusing on the creative collaborations among architects and structural designers, this issue presents some 13 projects with unique qualities and processes that represent the fruits of a renewed relationship between theories of space and the logic of mechanics.